Street food aficionados know that when it comes to quality, variations abound on the street as much as they do behind the walls of restaurant kitchens. In New York, residents of every borough fiercely argue the best attributes of a take-away slice of pie (pizza, that is). Up here in Canada, you might find a discussion board in search of a resolution on where to find the best poutine. And in my hometown of Minneapolis, locals replace last week’s best Pho with this week’s. A hallmark of rating street food in these parts is that the dingier the place, the better the food. In Kolkata, that litmus test is a bit trickier to use since nearly every brick in Kolkata is dingy, and dingier may just mean contaminated. So how do you go about sampling the street food across Kolkata? First, take a guide. I’m lucky that mine grew up in Kolkata, speaks fluent Bengali, and has no desire to see me wheeled into a hospital. The first time I visited India, Surya made sure I abided by the following rules: don’t drink the water, and don’t eat any street food made or served with ice (i.e. fruit juices, lassis, certain yogurt-based delicacies). They restricted my options, but Kolkata has so many choices for street food that I didn’t really take much notice – except when I happened to stop, panting under the bright sun, in front of a juice cart piled with luscious pineapples, mangos and guavas, and Surya dragged me away. He offered, as compensation, some fake, orange-flavored Miranda soda instead. Eventually, Surya had greater confidence in my constitution. He grew lax in his rules and figured that I could handle what any other Indian faced. 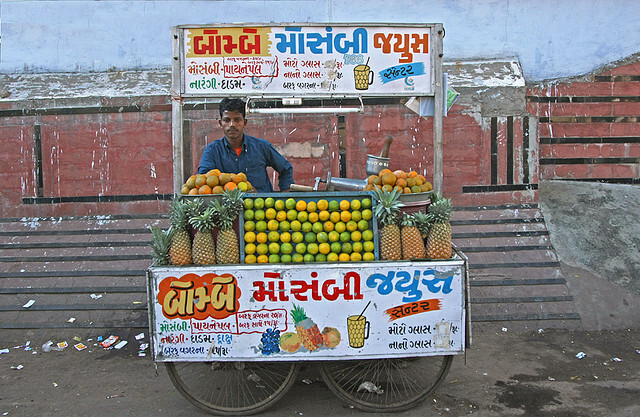 By the next summer I was eating fruit juices on the street in New Market and, in Vivekananda Park, downing three or four snacks called “water balls,” in one sitting. I’m not sure what this change says about my beloved’s desire to keep me pathogen-free. I choose to think about the positives: I’m one step closer to blending in. When you’re white in India, you take advances where you can get them. Second, accept the inevitable. Whether you like it or not, if you travel to a developing country you are likely to, at some point, get sick. You can do all the planning and preparation, follow all the right rules but, inevitably, the grime and germs will settle onto at least one unchecked corner of your carefully arranged universe. The good news is, although you may get terribly sick for a couple of days, you’re likely not to experience the same situation again. You’re inured. Take, for example, the time a wave of typhoid (a water-borne illness) swept through the fledgling university where I worked (you’ll be glad to know this was not in India). 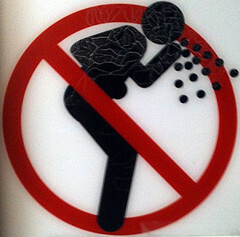 Typhoid is not fun. It feels as though you have a massive tumor expanding inside your skull. Every external facial feature throbs as a result. Sun makes it worse. So, you have to hide yourself in the dark all day as well. But, truth be told, the second time I had Typhoid, it wasn’t so bad. A little headache is all. The threat of death always lurks, of course. But no one really thinks about that. If you die from a food-borne illness you really just have terrible luck. You’ll be glad to know in recent years most Indian cities, including Kolkata, have confronted the hygiene concerns of eaters. And food vendors themselves clamor for assistance in delivering quality, healthy food. For a long time the Kolkata Municipal Corporation regulated the street food sector, albeit ineffectively. A simple lack of education kept most vendors from following the rules. For example, even though it was outlawed, Metanil yellow (a coloring used in textiles) was frequently used as a substitute for saffron. The city has since begun a more thorough inspection process of vendors across the city. Now, it’s a model city. Much of the danger in street food lies in pathogens spread by bacteria-infested water. Most people assume the problem begins with the quality of the water itself, so that not much can be done by a seller to keep his food healthy. However, a 1992 study discovered that the problem was rarely the water but how vendors handled their instruments. Leaving a washed pot upright, for instance, allows a puddle of water to collect at the bottom. It’s a habit not uncommon in kitchens across the West. But under the heat, humidity and pollution on the Indian street that pot becomes a potential breeding ground for bacteria. The solution was to institute training programs where vendors learned hygienic methods for cooking and cleaning. Contrary to the popular conception that street sellers care less about hygiene and more about profit, most vendors recognize that the relationship is symbiotic. Their success depends upon delivering quality food. Third, money talks. No city is free of food vendors who take risks, who deliver sub-standard fare and border on dangerous. Perhaps the potential for unhygienic food is greater in a city like Kolkata that continues to develop its regulation standards. So, for better or for worse, there is always the universal law of money to stand by. For both health and quality, you are bound to find a better selection of street foods in the wealthier areas of the city. The higher the income level of a neighborhood, the more rupees its residents will spend. Those consumers also have greater expectations. New Alipore is known as the diplomatic neighborhood in Kolkata and is filled with ex-pats and other bureaucrats who have both the hankering for bhel puri or vegetable cutlets and spare change in their pockets. Salt Lake, a newer development, has welcomed a whole new crop of street vendors catering to Kolkata’s yuppies. The price of Kolkata street food can range from a few rupees to a couple of dollars. And the rule, “you get what you pay for,” often applies. Fifth, do some light reading. Don’t dismiss the guidebooks. I know, I know. It’s often the case that you follow a suggestion, get lost four times before finally finding the restaurant, and the food has gone decidedly downhill (if it was ever uphill). But every now and again, a guidebook can hit on a not-so-hidden gem. You just need to read between the lines. “A favorite hotspot,” for instance, is likely to look smart but bat poorly. “Surprisingly tasty,” however, could indicate drool-worthy praise. Moreover, all the venues usually have been tested by a human guinea pig, so you can bet on safety. But don’t stop at traditional guidebooks. 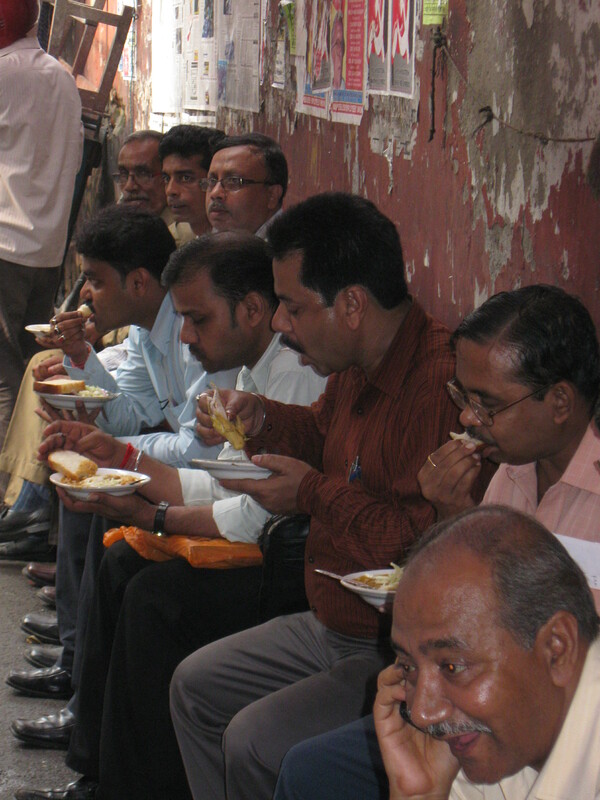 Kolkatans are natural foodies, and food is a major topic of conversation on many forums. I like to check India Mike, which is a community website for travelers all over India. The site offers forums for the major cities, including Kolkata and a forum on Indian cuisine and cooking. Zomato is an online food guide that offers community reviews and menus. And if you’ve landed in Kolkata without having turned a page or clicked a link, stop by a bookstore and purchase the Kingfisher Kolkata Explocity. Perhaps you find yourself one day standing in front of a smiling vendor sporting a dirty shirt. His succulent chicken roll rests in one hand and a mess of tamarind sauce and chili paste drips from the other. And you are still not sure whether you should hand over your change. 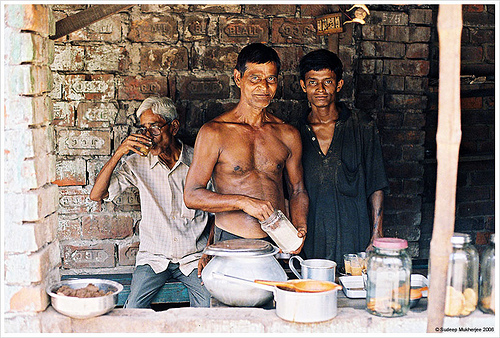 Think of this: Bengalis are not only food lovers, but they are also amateur pharmacists. Tell a Bengali you’re sick, and she’ll spout off a list of medicines you can try, from the most tame (an anti-inflammatory pill) to the most bizarre (incantations over a handful of salt). No matter how sick their food makes you, Bengalis always stick around to point you to the nearest pharmacy or wacko. Your choice.